>> Keen Footwear is a great branding case study. If the shoe fits. I’ve purchased two pairs of Keens for work, one pair of sandals, and two pairs of light hikers because they fit my feet perfectly. I’ve never heard anything from Keen about fit. ( Or about catering to peasants, for that matter.) Instead, the Keen brand strategy revolves around the theme of the “hybrid life.”Where did that come from? 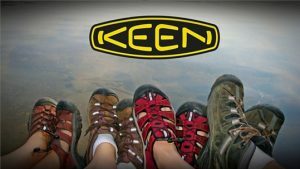 Like most great brands, Keen was launched with one simple idea. Their entire brand strategy focused on sandals with toe protection. Designer Michael Keen’s ah-ha moment derived from his experience as a competitive sailor. Until Keens came along, serious sailors never wore sandals. Too many stubbed toes! So Keen came up with the Newport Sandal and dubbed it a hybrid — somewhere between a shoe and a sandal with visible reinforcement in the toes. Now sailors are moving away from Top Siders and embracing the protection provided by Keen’s distinctive toe design. There’s even a Keen model that looks like a deck shoe. But sailing is a preppy, upper crust activity, and Keen’s brand personality is definitely not preppy. You won’t see any sailing in Keen’s marketing materials, and I doubt they’ll be sponsoring an America’s Cup boat any time soon. Keen shoes are not high fashion, but they’re highly functional and amazingly comfortable. They appeal to river rafters, hikers, beachcombers, bicyclists, campers, fishermen and just about anyone who loves to play outdoors. Every model they make shows Keen’s original benefit… toe protection. Needless to say, the brand plays well in the workboot category. But more than that, it’s also popular among urban hipsters in places like Portland, Seattle, Boston and Austin, Texas. Unfortunately, most people don’t know what that means. It’s a conjured-up lifestyle thing that only makes sense to a tiny sliver of the peasant market. Like those of us lucky enough to live in Bend, Oregon. When it comes to brand affiliations, Bend is the perfect town for Keen. We get it. Recreation’s the name of the game here, and locals are very good at getting outside and having fun… Paddling or fishing the Deschutes River, mountain biking, skiing, hiking, running the river trail. The hybrid life is what we’re all doing here. Or at least aspiring to do. But the folks at Keen like to say “hybrid life” is deeper than just what you do in your spare time. It’s “a call to create, play and care.” That’s the heart of the Keen brand, and the company has demonstrated authenticity on all three fronts. It’s one of those companies that’s genuinely trying to do good things. And that commitment is built into their brand strategy. When it comes to caring, Keen walks the talk. When the tsunami hit Thailand and Indonesia in 2004, Keen donated its entire marketing budget for the year, almost $1 million, to tsunami recovery efforts. On the sustainability scale, Keen CEO James Curleigh considers Keen an “accidental environmentalist”. They launched a line of bags and wallets using scrap polyester and nylon. So now the company is heralded as “green” and eco-friendly. But to hear Curleigh tell it, the move had more to do with material costs and smart business decisions than environmentalism. s helped with trail maintenance in Portland’s Forest Park. And one of Keen’s recent advertising campaigns encouraged people to rekindle one of the favorite parts of their childhood and incorporate Recess into their adult lives. Sounds good to me. Peasants deserve a break. We work hard. “Bear tested, Bear approved” with Bear Grylls from Man vs. Wild. 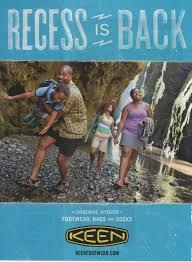 Keen’s agency is obviously trying to make “Recess” more inclusive. They’re working to expand the definition of “outdoor recreation” and include a broader range of audiences. Maybe they’re trying a little too hard. eem authentic to me. Compare it to the photography that Patagonia consistently produces… it’s no contest. In the Keen ads there are no peasants, no grungy hipsters, no bearded mountain men. They’re all models — cleaned, pressed and ready to trek from one photo shoot to the next. I’ll bet most of them even have noble, pointy feet. Which brings me back to Michael Keen’s original design. Keen said he considered all kinds of feet before deciding on a last that fits 90 percent of the population. But there aren’t that many of us with peasant feet. 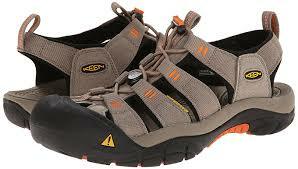 The fact is, the lucky people with noble, Egyptian feet can fit into just about any shoe, including Keens. But not vice-versa. 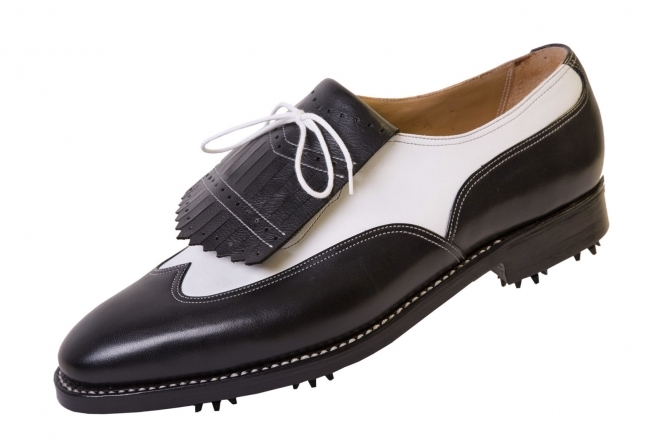 Try shoving a stubby, peasant foot into the typical golf shoe. It’s impossible. Just look how pointy they all are. It’s almost as-if the powers that be in the golf industry want to perpetuate that image of noble exclusivity. Golf shoes just don’t fit peasant feet. They won’t even make shoes for the working class, much less golf courses! So here’s what I hope: I hope Keen gets into the golf market. If they choose to make deck shoes and biking shoes, why not golf shoes? The toe construction of a Keen is absolutely perfect for the demands of the golf swing, and no other golf shoe accommodates the common foot. And when they do move into that market, I hope I can do the ads. Because nobody knows peasant golf like I do. It’s appropriate time to make some plans for the longer term and it is time to be happy. I have learn this post and if I may just I want to recommend you some fascinating issues or advice. Maybe you could write subsequent articles regarding this article. I wish to learn even more issues about it!